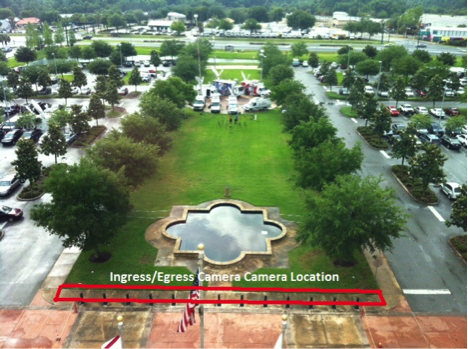 The ingress/egress camera position is defined as the portion of the sidewalk, on the east side of the Seminole County courthouse, across the road from the main entrance. This position is behind the black pillars and in front of the grass. It is bordered by the sidewalk the surrounds the grass median that faces the courthouse. See photos 1 and 2 for a visual representation of this location. This position is available for use by still and video photographers to document the ingress and egress of the participants and attorneys associated with the State vs. George Zimmerman. 1.) Cameras must be freestanding and cannot be connected to any cables. i.e. video cables, a/c cords, etc. 2.) Tripod use is acceptable, but free standing lights are not allowed. 3.) This is a camera area only. Reporters and other talent may work in this area, but reporter live shots and interviews are prohibited. 4.) 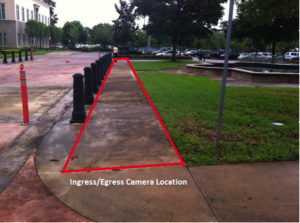 Cameras, and other equipment, must not block the sidewalks on the north and south edges of this area. This portion of the sidewalk is needed for access to the courthouse by employees, attorneys and the public. 5.) This position is defined for short term use. Camping out all day is not allowed. 6.) Portable live equipment is allowed. For example, TVu, LiveU and camera mounted microwave units. Use of camera mounted microwave equipment must be coordinated before use. The Seminole County Sheriff’s Office will enforce the above restrictions and may restrict the use of this area for security reasons.